Since we and lots of our customers had many problems with this scanner, we have removed this device from our assortment. As an alternative we recommend the Reflecta MF-5000 or the Braun FS-120 or the Nikon LS-9000 ED. 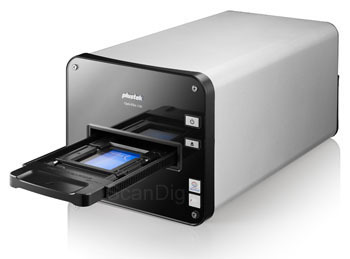 The Plustek OpticFilm 120 is the new 35 mm and medium format scanner from Plustek including the scan software SilverFast Ai Studio 8. The scanner digitizes 35 mm slides, 35 mm negatives and 120/ 220 mm medium formats with frame sizes of 6x4,5 cm bis zu 6x12 cm. An optical resolution of 10600 dpi can be achieved. Furthermore the scratch and dust removal function is also supported. For scanning the provided adjustable 120/220mm film holders are easy to load and holds 120/220mm film strips flat. Batch scanning is also available thanks to the automated film transport. Those who order addtional film holders are able to equip the these while the first holder is being scanned. According to the manufacturer the scanner is for professional photographers, ambitious hobby photographers and photo enthusiasts. Software plays as important role as hardware to deliver a brilliant image. The OpticFilm 120 comes with the world recognized professional film scanning software, SilverFast Ai Studio 8, and it is full functionality. For example, SilverFast iSRD® helps dust and scratch removal and optimizes images. SilverFast Multi-Exposure® increases the dynamic range and reduces noises. Auto IT8 Calibration® helps color calibrating in 2 minutes and ensures correct colors. All in all, SilverFast Ai Studio 8 meets the highest standards, and these SilverFast software features are well-combined and perfectly-integrated with the OpticFilm 120.